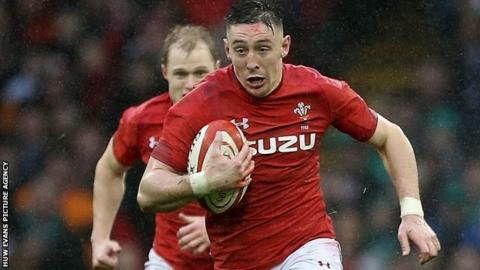 Josh Adams will join Cardiff Blues from Worcester after a breakthrough season with Wales. The 23-year-old scored three tries as Warren Gatland's team clinched the 2019 Six Nations Grand Slam. Adams' move to a Welsh region means he will still be available for international selection. Adams has scored 34 tries in 59 appearances for Worcester. He was the Aviva Premiership's joint-top scorer in 2017-18 with 13 tries and 17 in all competitions and scooped both the Warriors' Young Player and Player of the Year awards. "In every Test he's played for Wales he's been outstanding," Worcester director of rugby Alan Solomons told BBC Sport. "He's established himself on the international stage and as a regular in that Welsh team. "Josh is an outstanding team man and a great bloke. We will be really sorry to see him go, but understand that, as a proud Welshman, he wants to represent his country. "We wish him all the very best and know that he will be giving everything right through to the end of the season." Blues' head coach John Mulvihill believes it is a significant signal of intent.